Not everyone plans a big vacation trip when the kids are out of school during Spring Break. It is, however, a great opportunity for some family time, especially if you can get a day or two off for a special adventure with the kids. From going to a baseball game to heading out of the city for a Mexican vacation, Phoenix and the surrounding area have a lot to offer during spring break. On top of year-round attractions like Waterfall Canyon, Arizona has a number of seasonal destinations like the Wet 'n' Wild Water Park, which is only open during the summer months, as well as annual events during this school holiday. Alternatively, if you need to keep children occupied while you are working, many of the Phoenix area cities and towns have Kids' Clubs for Spring Break; contact your city's Parks Department to see what programs they have available. March is the month for Spring Training and the Cactus League baseball tournament, which makes Spring Break an excellent time to plan a trip to a local ballpark. Fortunately, tickets are more reasonably priced than regular season games, and the ten Spring Training stadiums around town are easy to get to. There are usually six games or more scheduled on any day in the month of March, and if you can't take off from work, there are evening games available, too. Each of the 15 Major League Baseball teams that play in Arizona for spring training can be found on the Cactus League website. There are several organizations around town that usually offer a short camp program during Spring Break. If you can't stay with the kids and take them here and there, at least they can have some fun at camp while you're working. The i.d.e.a. Museum, for instance, offers a hands-on day camp for ages 6 to 12 and 10 to 15 where kids will be introduced to the basics of engineering design as well as a variety of science, technology, engineering, arts, and math (STEAM) concepts. Similarly, the Arizona Science Center offers four different camps covering first through sixth-grade students. Wet 'n' Wild opens on a limited basis for the Spring Break season, and the Golfland and SunSplash parks will have race cars, bumper boats, laser tag, miniature golf, and three water slides open during Spring Break. The indoor wave pool at Kiwanis Park in Tempe is open year-round (except during maintenance periods), but it is also a popular place during Spring Break. Three pools in Chandler—the Hamilton Aquatic Center, Mesquite Groves Aquatic Center, and Nozomi Aquatic Centers—have Spring Break sessions. The Mesquite Groves Aquatic Center features a lap pool, diving area, two slides, water vortex, lazy river with tumble buckets, and a play area for kids. The Hamilton Aquatic Center features a lap pool, diving area, two slides, water vortex, a current river, and a play area for kids. The Nozomi Aquatic Center features a 25-yard, eight-lane pool, a 112-foot figure-eight water slide, a separate diving well with a one-meter diving board and a three-meter diving board. Hours and pricing information vary per pool, but costs are generally between $1 to $3 per person per day. Some other municipal public pools are also open. Check with the neighborhood parks and recreation department websites for more information. Taking a scenic drive on the Apache Trail can be a fun way to spend Spring Break and teach your kids about the history of this region. You can start your journey at the last surviving stagecoach stop along the Apache Trail, Tortilla Flat, then continue on to Canyon Lake for a day of swimming or a waterfront picnic. The Waterfall Canyon trail is an easy hike; you can even do it with younger children. This is a great way to get the kids outside, see some petroglyphs, and let them do some climbing on boulders, too. However, you probably won't see any waterfalls in March unless the region has experienced heavy rain recently, but the sights are quite breathtaking nonetheless. Be sure to bring water and a hat as the days get quite hot and dehydrating on the trails, even in spring. During Spring Break there are always festivals or special events going on in and around Phoenix. The Chandler Jazz Festival typically occurs near the end of March while the Chili Cookoff and Carnival take place mid-month. Additionally, almost every suburb of Phoenix also has a monthly Art Walk, and there are many cultural festivals that take place during the month as well. The Phoenix Zoo is located in Papago Park in central Phoenix. It's easy to get to from all directions, and it is a lovely zoo, especially on a day when it isn't too hot. Get there early on those warmer, sunny days. If you haven't been to Wildlife World Zoo and Aquarium, you might want to give that a try for a change of pace. They are more focused on exotic animals and located on the west side of town in Litchfield Park. The fish are jumping at SeaLife Arizona where you can get up close and personal with seahorses, sharks, rays, tropical fish, and the sea turtle, Ziva. SeaLife Arizona is in Tempe. OdySea Aquarium in Scottsdale has 200,000 square feet of aquatic entertainment and education. Daily events at Odysea Aquarium include feedings, caretaker interactions with the animals, and Q&A sessions with aquarists. Right next door to OdySea Aquarium you can mingle with the butterflies in climate-controlled comfort at Butterfly Wonderland. The butterfly conservatory, the highlight of any visit to Butterfly Wonderland, is 10,000 square feet of rainforest, complete with a koi pond and a butterfly bench for family photo opportunities. The farms are slowly but surely disappearing in Maricopa County, and as development continues, it's getting harder and harder for kids to see a real cow around here. However, at Shamrock Farms you can see thousands of cows and take a cool tour of this huge, high-tech operation. There's no petting zoo, but if you bring the little ones there is a playground, and you can bring your own snacks for a picnic. For a more close-up, casual experience, visit Superstition Farm where you'll experience the family dairy farm, take a tour, and pet some of their resident animals. Amazingly enough, Castles and Coasters in Phoenix is the closest thing to a theme park in the Phoenix area. The water slides and features are only available during the summer, but the miniature golf courses, large arcade, and the rides—including roller coasters—are always popular year-round. For younger kids, Enchanted Island Amusement Park is at Encanto Park in Phoenix and features rides and games meant for children ages 3 through 9. There are plenty of lakes close by, but if you don't want to rent a boat you can even fish in one of the many urban lakes around town. Fishing is a great way for kids to get outside in the fresh air, learn something, and have a day with you relaxing by the water. 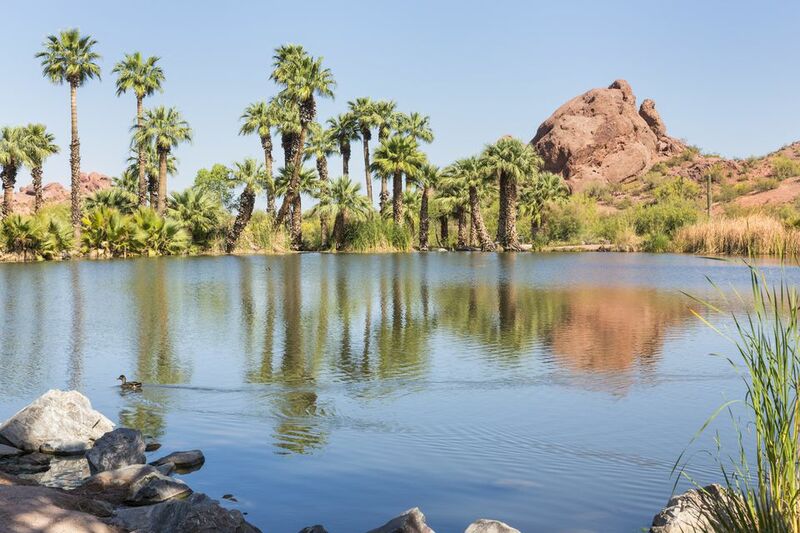 Some of the best lakes near Phoenix for fishing for rainbow trout, catfish, tilapia, sunfish, crappie, and largemouth bass include Alvord Lake in Cesar Chavez Park, Cortez Lake in Cortez Park, and Desert West Lake at the Desert West Park and Sports Complex. However, keep in mind that in order to fish in Arizona, you must obtain a fishing license first. If you are looking for a great day trip, a ride on the Verde Canyon Railroad is fun for everyone, but remember to call first to make your reservation. The Verdy Canyon train station, located in Clarkdale, is about a two-hour drive from central Phoenix to Clarkdale. During peak months (and March is one of them) there are two trains per day, one in the morning and one in the early afternoon. The train ride itself takes about four hours total—or two hours each way. If there has been any precipitation, there could easily be snow in March at one of the northern Arizona ski resorts, meaning snowboarding, sledding, and cross-country and downhill skiing are all just a few hours away from Phoenix. Some of the best places for winter sports near Phoenix include the Arizona Nordic Village in Flagstaff, Sunrise Park Resort in Greer, and the Elk Ridge Ski Area in Williams, Arizona. However, you should check the individual ski resorts' websites or call the hotline for the current snow report before you go. Bowling is fun for everyone, and during the day it is easier to find open bowling (no leagues) than in the evening. Find a bowling alley near you and bring the kids and their friends. Remember, even if you are a 200+ average bowler, they just want to have fun! After bowling, you can also enjoy some laser tag or arcade games. In the northwest, at Uptown Alley in Surprise, you can do all that. In the south, at the UltraStar Multi-tainment Center at Ak-Chin Circle, you can do all that and go to the movies, too. For a fun idea for a spring break activity the whole family will enjoy, consider treating your kids to a movie week in Phoenix and go to a movie once a day for five days. At the end of the five days, spend some time talking about the movies and then have your own at-home award ceremony for best film, best actor/actress, and best screenplay or even make up your own award categories. As an added bonus, some of the local theaters also allow guests to order food and beverages right from their seats. Many of these theaters have also been upgraded to include more comfortable seats, better sounds, and bigger screens. Lake Havasu City is about 200 miles from Phoenix and features the enormous Lake Havasu and the London Bridge, a replica of the famed bridge in England. If you're looking for a relaxing and fun escape from the city this Spring Break, grab your speedboat, several cases of beer or wine, not much clothing, and head to Lake Havasu. However, keep in mind that this city is also a popular Spring Break destination for college students, so some of the parties and crowds might not be suitable for children. Puerto Peñasco, Mexico, is known to local English speakers as Rocky Point. It is actually the closest beach to the Phoenix area, but still about 215 miles away. Some people love it, and some people hate it. Although Rocky Point does attract families, it also is a destination for college students during Spring Break. No matter who you are, remember that Mexico is a different country. Not only do you need travel papers to go and return, but it is important to understand their laws and how they operate. There have been violent incidents there, and the State Department has issued warnings (Rocky Point, or Puerto Peñasco, is in Sonora, Mexico). Of course, there is violence here, too, but when you understand your own backyard you can probably steer clear more easily.